No need to feel guilty about eating pizza! What makes this pizza so unique is that the crust is made out of cauliflower. 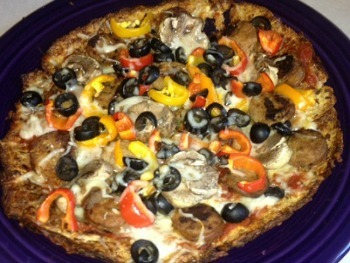 As I don’t know who came up with the idea of creating cauliflower pizza crust – I thank you! This is a great low carb option if you are trying to eat healthier or on a weight loss regimen. Most recipes for cauliflower pizza crust call for cooking the riced cauliflower in water or microwaving it. The cauliflower rice is then drained and squeezed (by hand) to remove all the water. I thought, there has got to be an easier way to do this! Then it came to me – how about roasting the cauliflower florets in the oven and then ricing them – no water mess to deal with. It works! I actually tested the cauliflower and tried to squeeze any water that might be left out of the cauliflower rice. Absolutely no water was found! For more great Low Fat Recipes, Low Calorie Recipes, Gluten Free Recipes, and Diabetic Recipes, check out my Diet Recipe Index. Also check out my Nutritional Chart for fat grams, fiber grams, and calories for all your favorite foods. * 1/4 cup egg substitute may be used. Add just enough until the dough is moist and able to shape. ** The cheese is not added just for flavor, it also helps bind the cauliflower while baking along with the egg. You could use any type of cheese to help with the binding. Some recipes use shredded low fat cheddar cheese, goat cheese, mozzarella cheese, or parmesan cheese. Preheat oven to 400 degrees F. Line a large baking sheet or Pizza Peel with parchment paper. I used my Pizza Stone. A pizza stone should be placed on a oven shelf and preheated with the oven. Preheat the stone to the temperature you will be cooking the pizza at BEFORE you put the pizza dough on the stone. Pizza stones need at least 20 minutes to heat up fully. Once pre-heated, the stone evenly transfers intense heat to the food being cooked, ensuring a particularly crisply baked base. Rinse cauliflower; cut into quarters. Cut off and discard leaves and cores; cut quarters into 1/4- to 1/2-inch-thick slices. In a large bowl or re-sealable plastic bag, mix together cauliflower slices, olive oil, salt, and pepper. Spread in a single layer in a non-stick baking dish or rimmed baking sheet. Bake approximately 20 to 25 minutes, turning every 10 minutes, or until cauliflower is browned or caramelized on edges and tender. Increase oven temperature to 450 degrees F.
One the roasted cauliflower has cooled, place roasted cauliflower pieces in a food processor and process (pulse) until the cauliflower is small and has the texture of rice. Place florets in bowl of food processor in batches. Process until evenly chopped but not completely pulverized. Do not over process, as the cauliflower can get mushy - you want a rough chop. Transfer the cauliflower rice to a large bowl. Stir in Parmesan cheese and beaten egg until well mixed. If you would like to add some dried herbs (of your choice), now is the time to stir them in. Either use your parchment-lined baking sheet or use a sheet of parchment paper on your pizza peel (this is what I did). Using Pizza Peel: Slide the cauliflower crust (with the parchment paper) onto your hot pizza stone. If using a parchment-lined baking sheet, place it in the hot oven. Bake approximately 25 minutes or until the crust is golden, crispy on the edges, and cooked through the middle. Once cooked to your liking, remove the baked cauliflower crust (along with the parchment paper) from the oven and let cool before adding your toppings. Using Baking Sheet: My daughter, Brenda Weller, says "It is recommended that you flip the crust after approximately 15 minutes so the other side also gets brown. The crust needs to be more than “golden” brown. If you cook the crust until it is almost burnt, you can pick it up and eat it with your hands. Otherwise, if the crust is not cooked long enough, you have to eat the pizza with a fork. The pizza is still good either way. It took me three (3) attempts to learn how to get the crust firm enough. Since I don't have a big enough spatula, I found that the best way to flip the crust without breaking was to put a piece of parchment paper on top of the partially baked crust and a cookie sheet on top of the parchment paper, and turn over onto new a cookie sheet." Using a spatula and your hands, spread the cauliflower mixture out to a 1/4-inch thickness. Pat it down thoroughly as you want it tightly formed together. Reduce oven temperature to 350 degrees F. Prepare your favorite toppings (see Topping Ideas below). Be careful not to add too many heavy toppings as the crust is somewhat fragile. Place the cooked Cauliflower Pizza Crust with your toppings (along with the parchment paper) back into the oven until the cheese melts, approximately 8 to 10 minutes. Remove from oven, add any additional toppings that you desire, and cut into pizza slices. Makes 1 large or 2 small pizzas.